If you were wondering what the opposite of Apple secrecy is, look no further than RIM. 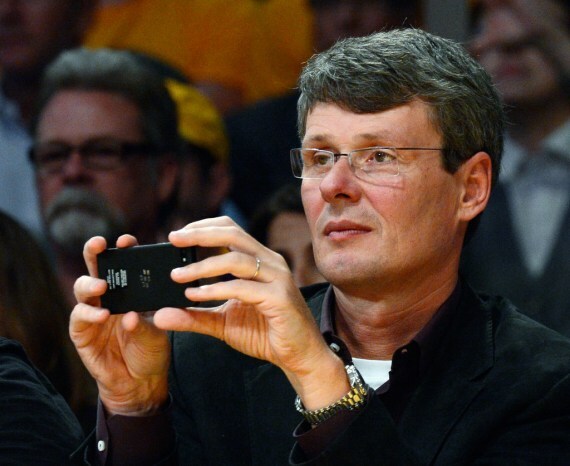 In what was clearly a staged PR stunt disguised as a leak, CEO Thorsten Heins and Vice President Andrew Bocking were spotted at a Lakers game openly using, not just carrying, what appear to be BlackBerry 10 devices. As in, waving them around and taking pictures while professional-grade cameras and lenses surrounded them. As if we’re supposed to believe that Heins could be absentminded enough to accidentally leak products this way. And then there’s the question of a sports or celebrity gossip photographer caring enough to capture new BlackBerry 10 devices, if they even know to expect them. If you recall, RIM plans to launch BlackBerry 10 handsets in February 2013, after enough delays for us to slowly stop caring. This means the Canadian firm must work harder to regain top of mind with both loyal consumers and the smartphone virgin demographic that Apple and Google are fighting over. The whole basketball paparazzi themed leak is about as cute as can be, but that’s surely just the beginning of what should be overwhelming hype for the next few months. Only to launch in the dead of winter. As far as the devices themselves, these don’t look like the Dev Alpha devices we’ve seen before. They are, however, incredibly similar to previous leaks of consumer-ready handsets. There’s no way to be sure, however. In either case, it’s great to see this type of enthusiasm as RIM’s CEO uses the company’s next-generation of products.